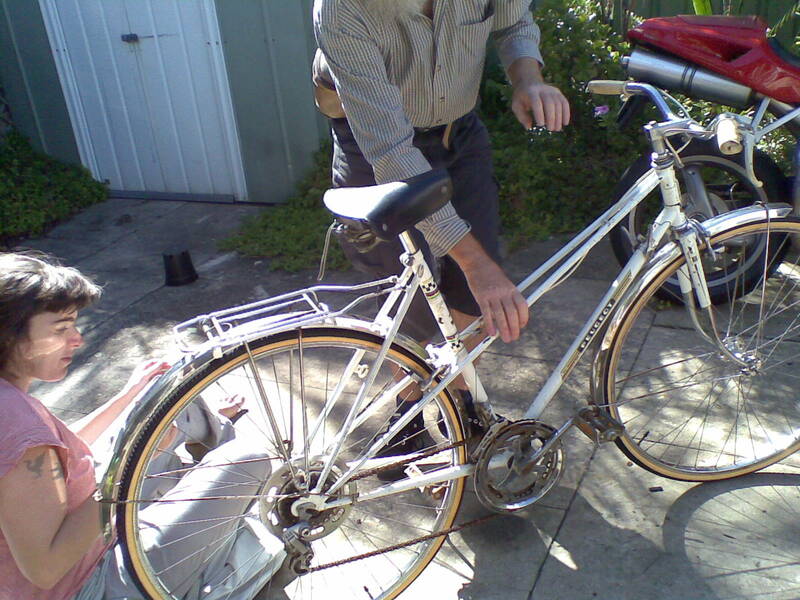 We asked The New Recyclist to look at the Peugeot mixte for his opinions on what needed doing to it, due to his expertise in all things regarding vintage bicycling and restoration and his interest in this particular project. A close up of the front wheel with the junior mechanic … De-rusting the frame and chrome work and decide on the finish after it is properly rideable, at the moment a look where the Peugeot decals are kept and a chromed finish is used for the frame may be what we aim for. 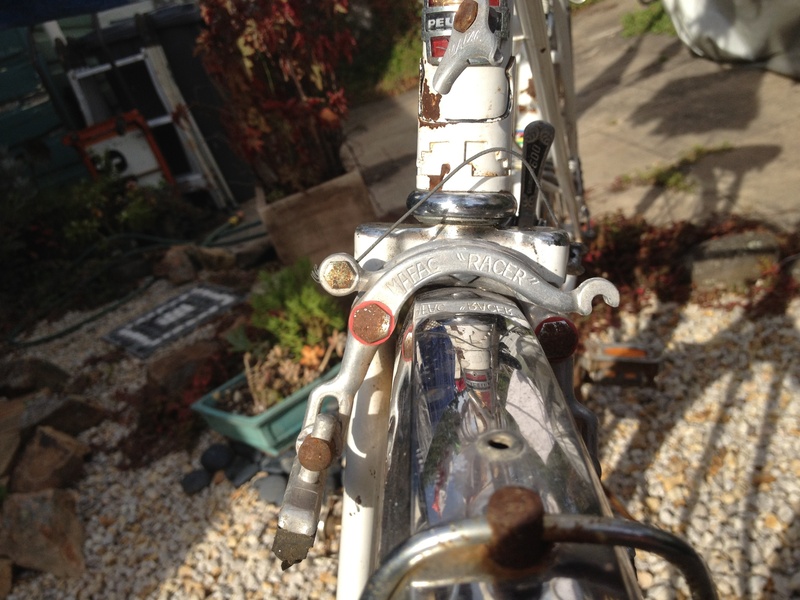 This entry was posted in Peugeot, Restoration, Vintage bikes and tagged Peugeot, restoration, vintage bike. Bookmark the permalink. Oh,that’s a lovely mixte. There’s no better feeling than spiffing up an old bike and taking it for that first ride. Hope you have lots of happy joy riding it around Newcastle. Thanks Ian. It is rideable now, for a short distance anyway, it will be lots better soon though. Have you determined age of this Pug? It is from sometime in the 80s, not sure exactly when. you can tell by the serial No and the decals. Post a shot of the seat tube decals and the front badge together with the serial No and we should be able to determine. Thanks Rusty, I will do that. 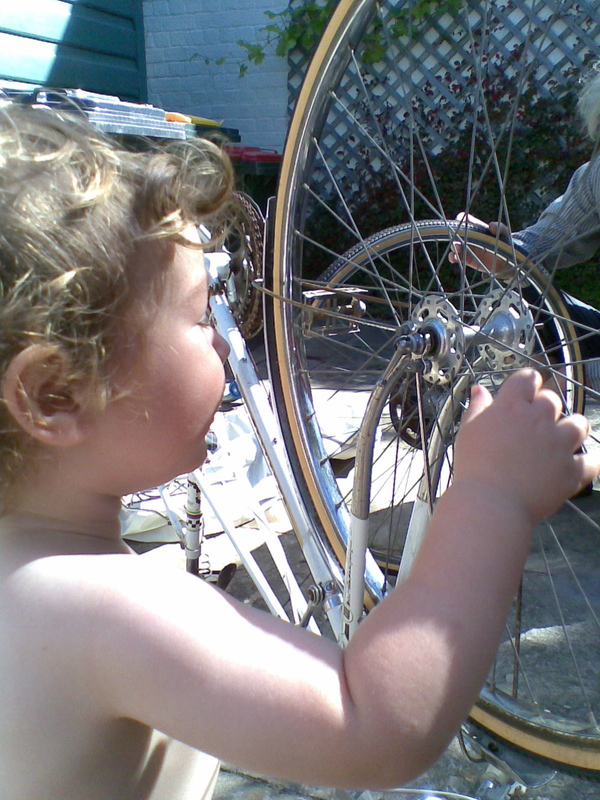 It is my daughter’s bike and she is unable to do anything to it for now due to other more pressing commitments – she is expecting a baby soon and house renos are also taking place. I will offer to do some work on it for her though and it would be interesting to hear what you have to say. I have not forgotten your previous request to see the other parts of the bike either and they will be posted later too. I am available to assist people in an appropraite forum. You need advise on what you are doing to the Bennett. It is very unclear from what you have written what your aim / brief / objective. It appears to me that there are some errors in the preparation, but that is dependant on what or how far you are going.Also what your expectations are concerning the finished product. I have methods to treat small road grim / “rust” that don’t resort to chemical’s, these were not detailed previously as the indications were that you were doing the whole bike and I just followed Mr Martins comment. I suggest you go and locate some of the Articles in The Australian Cyclist probally late 2009 to early 2010. WD40 should never be used near a bike. It was not what it was invented for, It does have a use in it’s original purpose that is water displacenment. I have used the product when I used to rally on the electics of the car before we tackled creek crossings. I am aware that there are some who say to use it to polish the paint, but I would be wary of this just in case of accidental spillage. Hi Rusty, with the Bennett, I am repainting it. I just want it for my own use and I am making it as shiny as possible. I didn’t end up using the molasses bath on it. 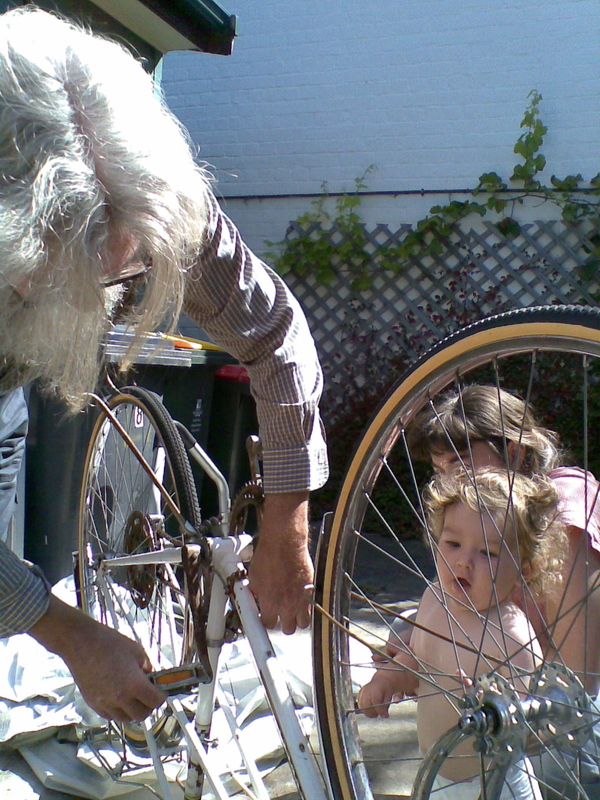 I’ve only used WD40 to remove gunk on the frame and wheels. After that I sanded rusty parts of the frame and wiped it with metho. It is all taped up now and I’ll paint it soon. For small jobs u do not need the M vat. As stated there are methods to handle this percieved “rust” Taping is not the only method. As stated before this is not the medium to discuss. if you(and others) want info I am available. I do not favour this blog way as it leads to misconceptions and distortions. The google and the barage of stuff on the internet does not assist the facts of the situation. Good luck! I just pulled my Peugeot out of storage, It’s been in there since 1996. I bought my bike approximately in 84′. It has a little rust, but it still looks good. Where would I get parts if I ever needed them? How do I clean the rust? With the rust it depends where it is. You can use a metal polish or some oil to get rid of it. Parts may be tricky but try to get it working first, it may not need any new parts. Good luck!